WORSHIP OF GOD IS THE HEARTBEAT OF THE CHURCH! 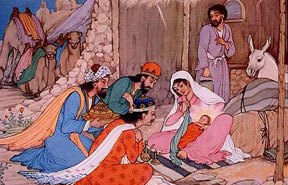 The Gospel of Matthew tells us about the “wise men from the East”. They really had only one objective for their long journey. If their journey could be compared to a race, then Bethlehem was the finish line, but what was the prize? In fact, when they set out they didn’t know where the finish line was either. Wise men on a Mission! So when they arrived in Jerusalem, they were saying to various people: “Where is he who has been born king of the Jews? For we have seen his star in the East, and have come to worship him” (Mt 2:1-12). The Infant King of the Jews was the prize they sought. To see Him and worship Him! These wise men were prepared for the realization of their objective. So when they finally found “the child with Mary his mother”, what did they do? “They fell down and worshipped him“. If this had been a test of some kind – they passed with flying colors! Of course, these wise men are remembered primarily for what they did next: “Then, opening their treasures, they offered him gifts, gold and frankincense and myrrh.” But this lavish gift-giving was part of their worship! We mustn’t separate their worship from their gift-giving. First came the worship, then the gift-giving. The worship established the context, the gift-giving was an extension of the worship, part of the worship. Worship of God is the heartbeat of the Church, and refreshment to the spiritual life.